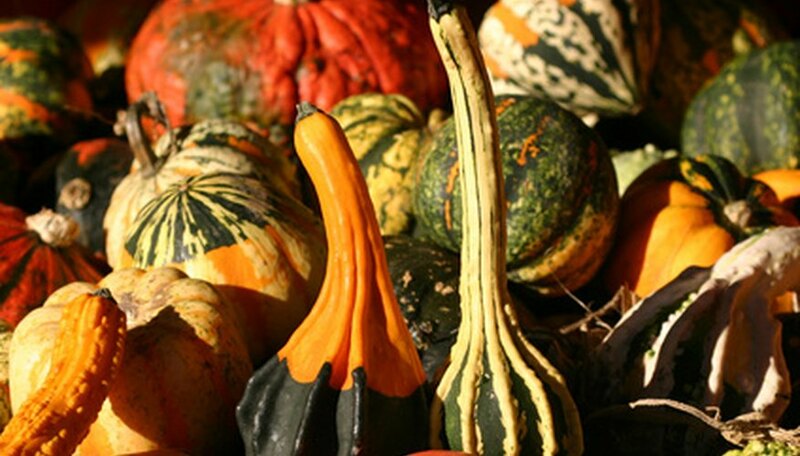 Gourds are similar to squash and pumpkin, but are typically grown for ornamental value. Many resemble miniature pumpkins or squash, and come in a variety of colors and shapes used for fall décor. Also used to make birdhouses, baskets and decorative bowls or scoops, gourds allowed to ripen fully on the vine dry to a hard shell that resists decay. Harvesting seeds for next season’s crop is relatively simple. Allow gourds to ripen fully on the vine. Mature gourds develop hard outer skin, the vine withers and seeds rattle in the shell when shaken. Harvest gourds with a 2- to 3-inch stem. The University of Illinois Extension warns that although mature gourds tolerate light frost, immature gourds suffer frost damage easily and should not be saved. Wash gourds to remove any garden soil and rinse in a weak solution of bleach and water, as recommended by the University of Illinois Extension. Mix 1 to 2 tablespoons of bleach to 1 quart of water. This prevents bacterial growth and reduces the chance of decay. Dry the gourds with a soft, dry cloth. Layer gourds in a single layer on slotted trays or screens. Place in a warm, dry, well-ventilated area to cure. During the curing process, the outer skin hardens further and the interior of the gourd dries. According to the International Seed Saving Institute, seeds continue to ripen for three to four weeks after harvest. Break open dried gourds and remove the seeds. Rinse seeds in warm water to remove any remaining pulp. Dry the seeds with paper towels and spread on a baking sheet or screen to dry completely. Store seeds in a sealed glass container in a cool, dark place until spring.